I am in need of new wheels after a hit 'n run. I am thinking of going with the WedsSport TC105n in 17x9 +35. I have seen Evo 8's and 9's on the 17x9.5 +32 and I really like the look. I however do not like the look of the 17x9 +25. Its just personal preference nothing else. My RS is NOT lowered and I do not want to lower it. I think the 17x9 +35 will just look "right" at the stock height. Would a 17x9 +35 work without fender work or spacers? I have 17x8 +30 mounted now and according to my math a 17x9 +35 would only "stick out" 8mm further which is what I am looking for. Thanks for all the help, I hope I made myself clear. Last edited by Russell K; Mar 31, 2012 at 01:24 PM. yes, +35 is the perfect offset for a 9" wide wheel. +30 will occasionally touch the fender with a bigger tire. Last edited by Blitz; Apr 17, 2012 at 05:03 PM. Bump - Before I buy these I want to make double sure these will fit w/o a spacer up front or rolling in the rear. That is the ONLY confirmed fitment, and it doesnt even suggest he was using a spacer. no rolling in the rear for sure, i cant help with the spacer thing in the front though, i know it will clear the strut, but i dont know about the caliper. Yes 17X9 +35 will clear your Brembos in the rear. I suggest minimal rolling in the rear but its not necessary. The Fronts will need a 3mm spacer. Last edited by deylag; Nov 16, 2016 at 06:57 PM. Reason: Updated information for those who find this thread and need the correct information quickly. Yes 17X9 +35 will clear your Brembos. I suggest minimal rolling in the rear but its not necessary. The Fronts will have no problems. 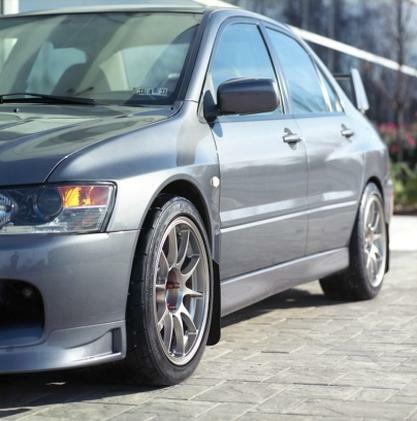 If anyone has any pictures of any TC105N's mounted on an Evo 8 or 9 plz provide a link. Not only for me, but for other ppl who may be searching for this answer in the future. Here is my car with TC105N's, they are 17x9's. No fender rolling required on 245/40R17. Unfortunately I don't know the offset, my car came with them. He uses staggered offset, I know the offsets but cannot tell. I promised Emery I wouldnt. If anyone cares plz do not pm me privately and ask lol I wont tell. No one else seems to be running a 17x9 +35 on the front besides the guy above. Last edited by Russell K; Apr 15, 2012 at 12:09 PM. I believe the +35's require at least a 3mm spacer to clear the front Brembos. I know the owner of the car you linked and he matched the spacer in the rear so the track width stayed the same from front to back. I have been looking for the answer to this. Wow - This is hard - Pickin' a wheel with the offset you prefer.